A123 is working on several research and development projects that could drastically improve the driving range for electric vehicles, A123 co-founder and R&D head Bart Riley said Thursday. The Waltham, Mass.-based firm develops and manufactures lithium-ion batteries for a number of applications, including electric vehicles. Riley, the company’s chief technology officer and vice president of R&D, was the keynote speaker Thursday at the 5th Annual Babson Energy and Environmental Conference, and afterwards spoke with the Business Journal. Riley said A123 is “sprinting” to cut the cost and improve the mileage range of electric vehicles by making advances in its lithium-ion battery technology. The higher cost and low driving range of electric vehicles are the major challenges for making the vehicles competitive in the market, and advances in batteries are seen as the key to solving both problems. Riley said the goal is to produce a battery with enough energy density that it could enable a 300-mile driving range. Currently, car makers have announced electric vehicles under development with ranges of less than half of that. Depending upon the success of the R&D programs, the company could be offering the longer-range battery within five to 10 years. Riley said that some of the R&D work for the electric vehicle batteries is being performed at the company’s facility in Waltham, which A123 just moved into last weekend from its previous headquarters and R&D center in Watertown. Meanwhile, Riley said the industry expects to cut the watt-hour cost of current batteries by 50 percent within three to five years, though A123 believes it may be able to trim the cost even further. “I think that we’re teed up and see a very attractive pathway for us in terms of cost reductions, that make us either competitive or differentiated across the board,” he said in the interview. The list of customers for A123’s automotive batteries includes BAE, Eaton Corp., Fisker Automotive, Navistar and Shanghai Automotive Industry Corporation. 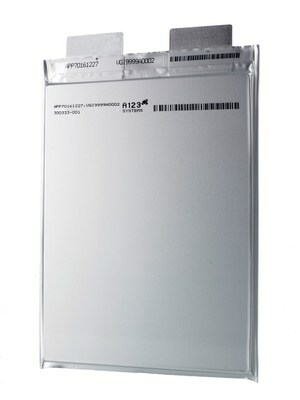 A123 also recently announced it has has been chosen to produce battery packs for a pure-electric vehicle by a “major” North American automaker, which is expected to hit the market in 2013. A123 said it will be producing the battery packs at its factory in Livonia, Mich., and the company began delivering engineering battery packs late last year. The North American automaker was not named.